LOS ANGELES, CA – 4 December 2013 – Got Tennis Elbow? Broadway Surgical Institute (BSI) has the answer! BSI continues to shine in the medical community as one of it’s highly trained partnering physicians – Dr. Timothy Davis, recently aired on the nationwide television show “The Doctors.” Doctor Timothy Davis starred on the television program while showcasing the new TENEX Health TX System procedure. 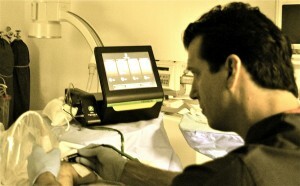 While on the program, Dr. Davis used the TX system to treat a patient with chronic tennis elbow. The TENEX Health TX System is used to treat various types of chronic tendon pain but most notably chronic tennis elbow. The Tenex procedure is simple, fast, and minimally invasive procedure that eliminates long recovery stays and reduces the amount of painful recovery time. To watch Dr. Davis in action and hear him discuss the Tenex Procedure, please click on the link to the television show below. Broadway Surgical Institute continues to trailblaze the medical frontier on new, advanced and minimally invasive procedures. If you have tennis elbow and feel that you may qualify for the Tenex Health TX System procedure, please call Broadway Surgical Institute’s hotline at 310-260-2827 to schedule a consult. We look forward to helping and treating you. SANTA MONICA, CA – 16 August 2013 – Over the past year, Broadway Surgical Institute has established itself as a center for professional medical learning. 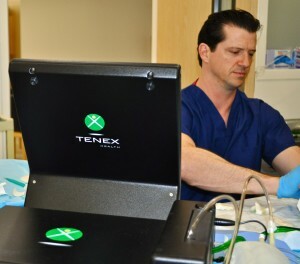 Recently, Tenex Health, Inc. partnered with Broadway Surgical Institute to train a number of local physicians on the Tenex Health TX™ System for the treatment of chronic tendon pain. Leading the course was Dr. Timothy Davis, Founder of the Center for Spine and Joint Restoration. Tenex Health TX™, a minimally invasive procedure developed in collaboration with the Mayo Clinic, uses advanced technology to remove damaged tendon tissue. Painful chronic conditions such as tennis elbow, golfer’s elbow, jumper’s knee, Achilles tendonitis and plantar fasciitis. TX™ technology combines both ultrasound imaging used to identify damaged tendon tissue, and the advanced TX MicroTip™ precisely breaks down and removes only the damaged tissue which causes pain. The recovery time for this procedure is relatively quick with patients experiencing near immediate results and pain relief. The anticipated full recovery time is approximately 2- 6 weeks for a return to normal activity levels. The Tenex Health TX System™ is FDA cleared and more than 6,000 procedures have been successfully performed to date. This innovative procedure takes less than 20 minutes and can be scheduled easily with Dr. Davis and Broadway Surgical Institute. Broadway Surgical Institute is one of the top Surgery Centers in Southern California, is a destination for both physicians and patients looking for the highest level of treatment.